The Mexican Stock Exchange (BMV) deployed a new system, built on Intel® Xeon® processors, with the infrastructure to handle up to 100,000 transactions per second—significantly more than the 1,000 transactions per second limit of the prior system. The new performance means the response capability of the BMV has improved hundreds of times. ...Today, the system handles transactions under 90 microseconds apiece, compared to the rates of between 35 and 90 milliseconds achieved by the prior setup. A series of filters prevents the handling of operations that exceed set volume and price ranges without affecting system performance. 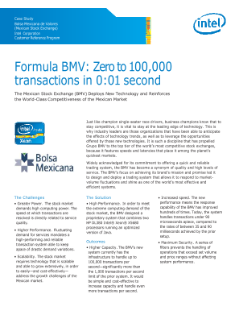 Read the full BMV: Zero to 100,000 Transactions in 0:01 Second Case Study.